In order to make your life as balanced as possible, you need to have good people in your life to support you. Friendship is so important for all of us, and I wanted to dedicate a whole podcast episode to it. As working moms, it can be difficult to create new friendships and maintain old ones. What can we do to help make space in our hearts for our most invaluable friendships, even in the middle of all that we have going on? 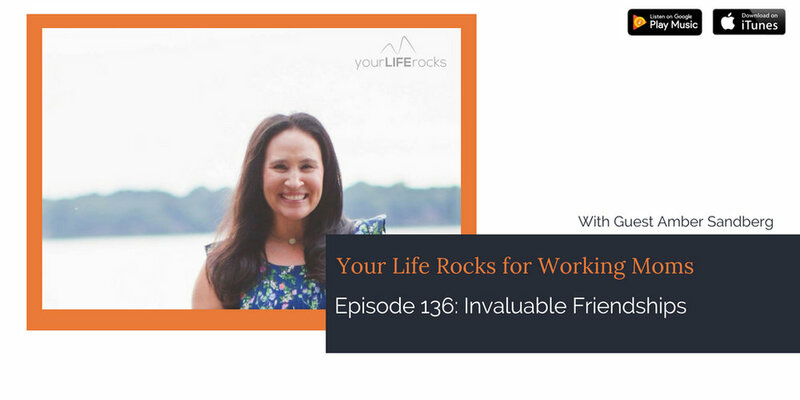 My guest today is one of my closest friends, and she has so many amazing tips and suggestions for those of us who want to cultivate friendship. I am so excited for you to get to know Amber! Amber Sandberg lives in the suburbs of Nashville, Tennessee with her husband and her two young daughters. Amber loves hanging out with her family, going on family vacations and vacations just with her hubby, anything turquoise and getting to know women (especially moms) on a deeper level. She has recently joined two of her passions, podcasting, and travel, and has become a travel agent who specializes in family travel. Amber is very social, and friendships are important for her, but she recognizes that everyone is on a spectrum. She advises you first that, if you are looking for friends, pray for them! Ask God to guide your steps to bring them into your life. Together, we have come up with these three tips to help you cultivate great friendships in your life. 1. Find friends that challenge you to be the best version of yourself. One of the things that I love about Amber is that she seeks personal development and lives with intention. When she shares about a marriage retreat she went to with her husband, it makes me want to work on my marriage. Together, we are always growing. 2. Shared faith is important. We pray for each other, hold each other accountable and we don’t have to worry about unsound advice. When you are letting people into your life, it’s important that they “get” this side of you. 3. Be willing to make an effort. Friendship is amazing but it takes sacrifice. You have to put yourself out there, make time for each other, and actually try. Seeing our friends even for a little while, and as often as possible, can make such a difference. You will also get to hear Amber’s thoughts on the Enneagram, finding your love language, and creating memories with your family. One of the things that I originally loved about Amber is her passion for travel and helping others intentionally plan to maximize on memories and family bonds through travel. Recently, her passion led her down a new path as a travel agent. Did you know that hiring a travel agent is free? Like no extra charge, and they save you money! I had no idea. Ladies, I am always saying to delegate what you can…this is something you should be delegating. Let an expert like Amber help you plan your trip. Amber not only will help you with all the details, but she goes the extra mile to help you intentionally plan financially. She has created the Vacation Planning Tool to help you intentionally plan years in advance for all the travel you dream about. Don’t just dream, make a plan and bring it into reality. You can schedule a free call with Amber to discuss your dream travel and how to make it happen by clicking here. You do not want to miss out on what Amber has to offer!